BACK TO THE FUTURE. Star Trek: Discovery is back this Thursday, with its season 2, on CBS, then Netflix. Augmented creatures, tattoos 3.0, synthesized clothing ... season 1 was full of tech finds, in line with the original sixties serie. Let’s have a look. "Kirk to Enterprise". Communicator, tricorder, combadge, PADD, replicator ... with these countless science fiction gadgets, Star Trek laid the foundation for a breathtaking fantasy world, from the launch of his original serie, in 1966. A pioneering world that has influenced many of today's technologies, such as mobile phones, 3D printing, tablet computers, virtual reality headsets and videoconferences. What's more natural than for the latest serie inspired by Gene Roddenberry’s universe, Star Trek : Discovery, to continues this tradition, featuring augmented creatures, fashion tech and beauty 3.0. A few hours before the broadcast of Discovery season 2, January 17 on CBS, and 24 hours later, on Netflix, Le Boudoir Numérique draws the visual panorama of the most interesting tech finds of season 1 with, icing on the cake, a detour by those of Star Trek: The original series. Captain James T. Kirk of the USS Enterprise (William Shatner) with a communicator, portable device allowing the crew members to exchange with each other, during ground missions, for example. Its derivative, the combadge, figuring the Starfleet emblem, will be worn, on the torso, by the crew members of Star Trek: The next generation, from 1987. Scientific Officer Spock (Leonard Nimoy) with a tricorder, a tool for detection, recording and analysis, to hold in your hand or to wear over the shoulder. Dr. McCoy (DeForest Kelley) and Kirk already know the the tablet computer ancestor. Subsequently, in other derived series, the PADD (Personal Access Display Device) will delight not only Starfleet members but also other alien civilizations. Nyota Uhura (Nichelle Nichols), communication officer, uses wearables, like those silver cylindrical wireless headphones. Lt. Keyla Detmer (Emily Coutts), augmented human with an electronic head gear (episode 1). Lt. Jira Arwani with a tactical helmet (episode 1). Lt. commander Airiam (Sara Mitich), human augmented with some synthetics (episode 1). USS Shenzhou crew member with augmented head gear (episode 1). Lt. commander Michael Burnham (Sonequa Martin-Green) receives her new uniform made by a replicator (episode 4). 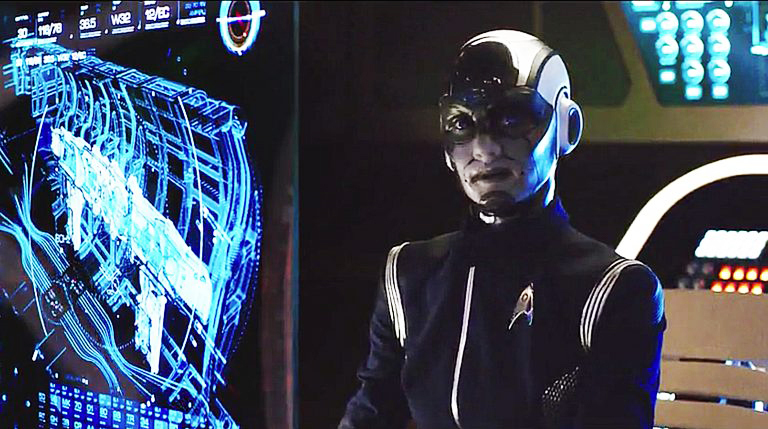 Michael Burnham’s virtual mirror that closes itself on vocal command (episode 4). Alien Tattoo artist (episode 15).